© Gaur et al. ; Licensee Bentham Open. Keywords: Protease, Pseudomonas, Casein zymography. Proteases covers up to 60% of total enzyme market and are valuable commercial enzyme that have biotechnological as well as industrial applications however the present known proteases are not sufficient to meet most of the industrial demands It is desirable to have new proteases with novel properties from different sources. Alkaline proteases hold a great potential for application in the detergent and leather industries [1-3] and are also reported to have been isolated from microbes, plants and animals. Proteases from plant sources have application in food industry . Previous studies in our lab have shown that proteases from senesced leaves of Lantana camara can have application in detergent industry as the enzyme is thermostable . Microbes are the preferred source of proteases because of their rapid growth, and the ease with which they can be genetically manipulated to generate new enzymes with altered properties [6, 7]. Proteases have been purified and characterized from several bacteria [8-12]. However there are only few reports on Pseudomonas thermaerum, Yang et al.,  have identified two strains of Psudomonas thermaerum isolated from activated sludge that could use lignin as sole carbon source and excrete peroxidases. A novel antimicrobial peptide (30 kDa) produced by a this bacterium isolated from the effluent pond of a bovine abattoir showed inhibition to a broad range of indicator strains, including pathogenic and food spoilage bacteria such as Listeria monocytogenes, Bacillus cereus, Staphylococcus aureus has been reported by Fontoura et al., . The partially purified antimicrobial substance remained active over a wide temperature range and was resistant to all proteases. S28 strain isolated from Nanyang oil field was identified to be as P. thermaerum based on homology studies and could degrade 82.02% of phenenthrene within 10 days . In our attempt to screen for microbial isolate that can provide stable enzyme, soil sample of the poultry waste site which is rich in organic waste was selected. In this investigation, we report the production and effect of pH, temperature, metal ions and substrate concentration on protease secretion whereby the culture condition were manipulated for maximum protease production. Pseudomonas thermareum GW1 was isolated from soil of poultry waste site and it extracellularly secreted this protease which was purified to homogeneity, characterized and found to be stable in the presence of several organic solvents. Ours is the first report that shows extracellular production of proteases from Pseudomonas thermaerum GW1 strain. Soil was collected in sterilized sampling bags of Ghazipur poultry waste site, India. The microbe responsible for the production of protease was identified. The classification was based on gram strain (-), catalase (+) and oxidase (+) reactions, using morphological and biochemical characteristics based on Bergey’s Manual of Determinative Bacteriology . Soil was selected from areas where naturally degraded feather were seen. The samples were brought to the laboratory and processed for the analysis the same day. Soil samples were suspended in basal media and kept for growth at 37°C for 6 days. At regular intervals of 6 hrs the activity of protease was measured and sample showing maximum activity was screened for protease producing strains. Samples of repeated batch cultures were plated on skim milk agar. After 24–48 hrs at 37°C, colonies which exhibited the largest cleared zones were selected and was further incubated in cultivation media for further 48 hrs and checked for protease production. The isolate GW1 was identified originally as a strain of Pseudomonas by our laboratory based on Morphological, Physical, Biochemical characteristics and the single colony was subcultured on bacterial culture plates supplemented with casein. The culture was sent for identification till species level to Bangalore GeneI India by partial 16S r DNA sequence analysis. The Basal media for protease production composed of (g L-1): Peptone, 5; Glucose, 10; NaCl, 0.5; CaCl2.2H2O, 0.1; K2HPO4, 0.3; KH2PO4, 0.4; MgSO4 · 7H2O, 0.1; and yeast extract, 5. The pH was maintained at 7.5. Microbes were allowed to grow in 500 ml conical flask containing 50 ml of the culture media that was maintained at 37°C at 140 rpm. 5% (v/v) of the 20 hrs old culture was inoculated in cultivation media . The above cultivation media were checked for enzyme activity at regular intervals of 6 hrs by the modified method of Tsuchida et al. . The bacterial strain was grown for 48 hrs at 37°C in the selected cultivation media. The culture medium was centrifuged at 10,000 rpm for 10 min at 4°C and the cell-free supernatant was precipitated with 0-60% ammonium sulfate. The precipitate was collected by centrifugation and dissolved in a small volume (1/50) of 10 mM Tris-HCl buffer (pH 8.0), and dialyzed against 4 liters of same buffer for 12 hrs at 4°C. This step was repeated twice. The dialyzed enzyme preparation was applied on a DEAE-cellulose column (2 X 24 cm) pre-equilibrated with 10 mM Tris-HCl (pH 8.0). The unadsorbed protein fraction was eluted with the same buffer (150 ml). The enzyme was eluted with a gradient of 2mM and 4 mM NaCl in the same buffer at a flow rate of 1ml/min. Active fractions that contained (80%) of the enzyme activity were pooled, and subsequently used for characterization. All steps were conducted at 4°C. Protease activity was assayed by a modified method of Tsuchida et al. by using casein as substrate. 100 μl of enzyme solution was added to 900 μl of substrate solution (2 mg/ml (w/v) casein in 10 mM Tris–HCl buffer, pH 8.0).The mixture was incubated at 45°C for 30 min. Reaction was terminated by the addition of an equal volume of 10% (w/v) chilled trichloroacetic acid then the reaction mixture was allowed to stand in ice for 15 min to precipitate the insoluble proteins. The supernatant was separated by centrifugation at 10,000 rpm for 10 min at 4°C; the acid soluble product in the supernatant was neutralized with 5 ml of 0.5 M Na2CO3 solution. The colour developed after adding 0.5 ml of 3-fold-diluted Folin–Ciocalteau reagent was measured at 660 nm. All assays were done in triplicate. One protease unit is defined as the amount of enzyme that releases 1 µg of tyrosine per ml per minute under the above assay conditions. The specific activity is expressed in the units of enzyme activity per milligram of protein. Protein concentration was determined by the method of Bradford  with bovine serum albumin as standard. SDS-PAGE was performed on a slab gel containing 10% (w/v) polyacrylamide by the method of Laemmli . 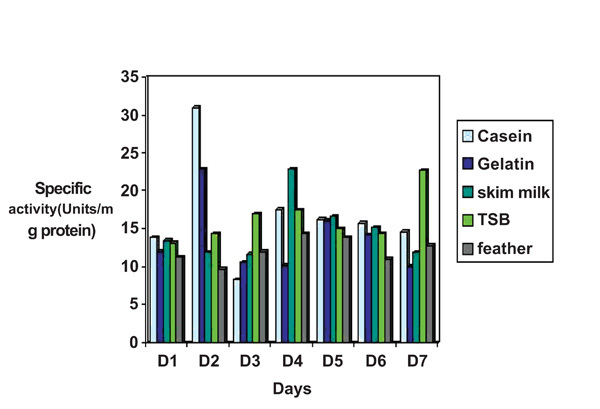 Casein zymography was performed in polyacrylamide slab gels containing SDS and casein (0.12% w/v) as co-polymerized substrate, as described by Choi et al., . After electrophoresis, the gel was incubated for 30 minutes at room temperature on a gel rocker in 50 mM Tris-Cl (pH 7.4), which contained 2.5% Triton X-100 to remove SDS. The gel was then incubated in a zymogram reaction buffer (30 mM Tris-HCl, pH 7.4, 200 mM NaCl and 10 mM CaCl2) left at 37°C for 12 hrs on rocker shaker.The gel was stained with Coomassie brilliant blue (0.5% w/v) for 30 min. The activity band was observed as a clear colourless area depleted of casein in the gel against the blue background when destained in 10% methanol and 5% acetic acid for a limited period of time. 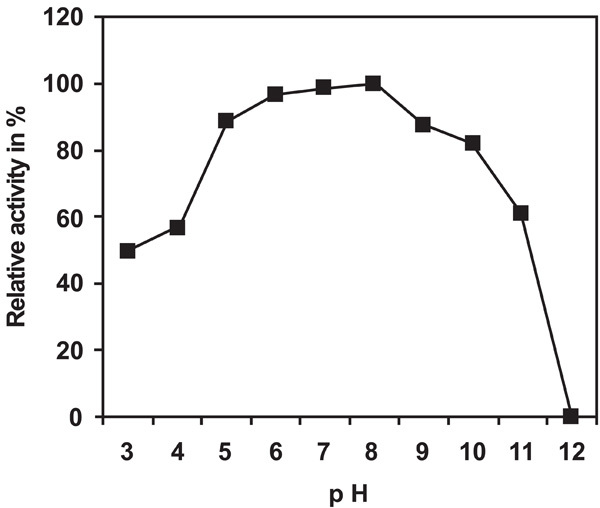 Effect of pH on the purified enzyme activity was measured at various pH ranges (3.0 – 12). Reaction mixtures were incubated at 45°C for 30 min and the activity of the enzyme was measured as described previously. The activity of the enzyme was determined by incubating the reaction mixture at different temperatures ranging from 20, 30, 40, 50, 60, 70 and 80°C were studied. The activity of the enzyme was measured as described previously. The effects of metal ions on enzyme activity (e.g., Ca2+, Mg2+, Fe2+, Mn2+, Zn2+, Hg2+, and Cu2+ [5 mM]) were investigated by adding them to the reaction mixture and pre-incubated for 30 min at 45°C pH 10.0. The activity of the enzyme was measured as described previously. The organic solvents used were Methanol, Ethyl acetate, Benzene, Glycerol, Sucrose, Toluene, Acetone, Hexane, DMSO, Isopropanol and Ethanol. In the stability test, 1.0 ml of organic solvent (100% v/v) was added to 1 ml of the reaction mixture and pre incubated at 37°C for 30 min. The remaining proteolytic activity was measured as described previously. Stability was expressed as the remaining proteolytic activity relative to the solvent-free controls (0%, v/v). Soil samples were analyzed for isolation of proteolytic bacterial cultures. Screening of microorganisms that produced protease was done on cultures isolated from soil of Ghazipur poultry waste site. Organic waste such as feathers and other poultry waste is essentially composed of proteins. Protease producing strains were selected by growth on skim milk agar, as described in Methods. Among the cultures tested, the laboratory isolate GW1 showed highest zone of clearance. The purity of the isolated bacteria was ascertained through repeated streaking (Fig not shown). Microscopic observation of the isolate showed a non sporulating gram negative rods, the bacterium grew aerobically and formed typical blue green, flat, large, grape like odour colonies. The strain showed positive reaction for catalase, oxidase, citrate, nitrate, motility, and production of pyoveridin and pyocyanin. Negative reactions were observed for indole, urea and starch hydrolysis (Table 1). These phenotypic characteristics based on Bergey’s Manual of Determinative Bacteriology  suggest the Pseudomonadaceae family genus Pseudomonas. The GW1 strain was identified to be as Pseudomonas thermaerum as predicted by 16S rDNA studies. Studying the Alignment view of the sequence of the isolated microbe using combination of NCBI GenBank and RDP database using 10 examples and nucleotide similarity. Nearest homolog was found to be Pseudomonas aeruginosa strain EKi (Accession No. FJ685995). The details are given in Table 2, 3 respectively. 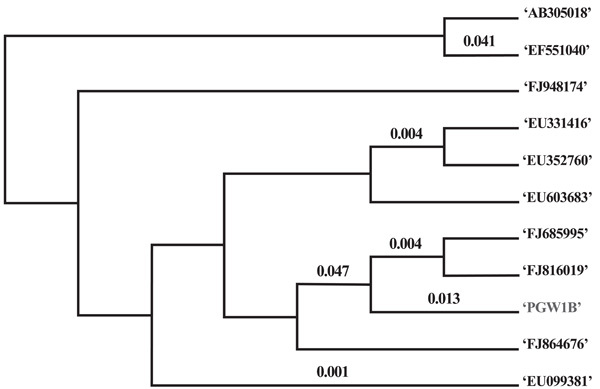 The sequence of the isolate GW1 was submitted to the GenBank (Accession Number GU951516)” and based on nucleotide homology and phylogenetic analysis it is found to have close similarity to Pseudomonas thermaerum strain EKi (GenBank Accession Number: F3816019) (Fig. 1). Phylogenetic tree made in MEGA 3.1 software using neighbor joining method. Study of effect of various nutrient sources on protease production by Pseudomonas thermaerum GW1. The culture was grown for production of protease as described in “Methods”. 1% of the above mentioned nutrient sources were added to basal media. pH of the media was adjusted to 7.5. 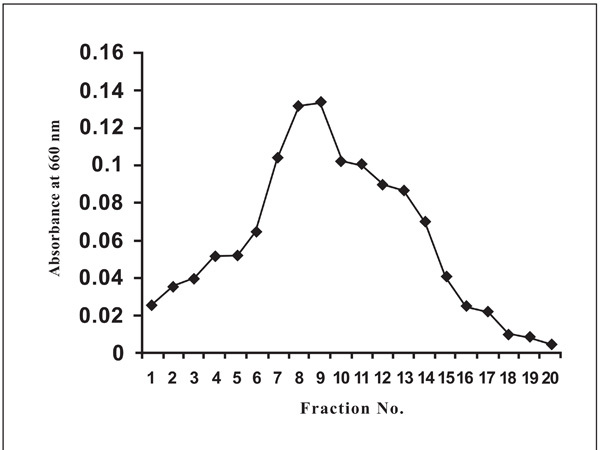 The bound protease on DEAE column was eluted with 0.2 and 0.4 M NaCl (in 10 mM Tris–HCl buffer, pH 8.0) Fraction of 0.4M NaCl showed a single peak of caseinase activity. 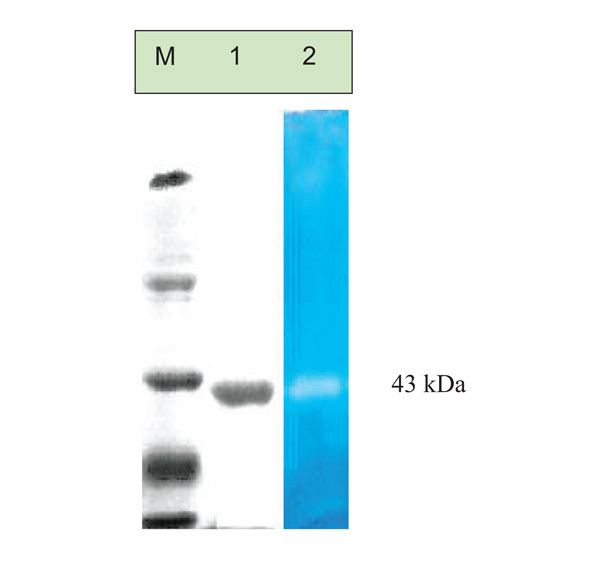 Acitvity gel electrophoresis of the purified protease, M: molecular weight markers, Lane 1: purified protease on 10% SDS-PAGE and Lane 2: Zymography of purified protease from Pseudomonas thermaerumGW1. Zymography was done by the method of Choi et al. Effect of pH on the activity of the purified Protease from Pseudomonas thermaerum GW1 pH optima was measured by incubating the enzyme with the substrate at different pH values at 45°C. The maximum activity obtained at pH 8.0 was considered as 100% activity. The treated enzyme solution was cooled rapidly in ice and the relative activity was measured under standard condition. Effect of temperature on protease activity from Pseudomonas thermaerum GW1. The relative activity was defined as the percentage of activity detected with respect to the maximum protease activity. The maximum activity obtained at temperature 60°C was considered as 100% activity. The treated enzyme solution was cooled rapidly in ice and the relative activity was measured under standard condition. Figure denotes Influence of different solvents on activity of the purified protease from Pseudomonas thermaerum GW1: purified enzyme (10µg) was preincubated with 100% v/v of various solvents vis Isopropanol (IP), Methanol (M), Benzene (B), Ethylacetate (EA), Acetone (A), DMSO (D), Hexane (H), Glycerol (G), Toluene (T), Sucrose (S) at 37°C for 30 minutes. The control (without organic solvent) and treated enzyme solution was cooled rapidly in ice and the relative activity was measured under standard condition as described in methods. Note: the relative enzyme activity of control fraction without organic solvent (0% v/v) was denoted as 100% The relative activity of treated fractions was defined as the percentage of activity detected with respect to the control fraction. Protease production was tested at various time interval (1–7 days) and influence of addition of various nutrient sources (TSB, Gelatin, Casein, Skim milk, Pigeon feathers) were evaluated in relation to enzyme yield. Pseudomonas thermaerum strain GW1 grew in five nutrient sources and produced protease. The highest protease production 32 units/mg occurred in Basal medium supplemented with casein whereas lowest in basal medium supplemented with Pigeon feathers 9.7units/mg protein after 48 hrs of cultivation (Fig. 2). The extracellular protease produced by Pseudomonas thermaerum strain GW1 was purified in two steps by 0-60% ammonium sulphate precipitation followed by anion exchange chromatography on DEAE- cellulose resin (Fig. 3). The recovered active fraction from 0-60% ammonium sulphate of culture broth was adsorbed on the DEAE- cellulose matrix. The bound protease was eluted with 0.2 and 0.4 M NaCl (in 10 mM Tris–HCl buffer, pH 8.0). The protease was purified 6.08 fold and about 9.3% of the total activity units was recovered. The specific activity of the purified enzyme was 137.54 units/mg. The purified enzyme could be stored in 10 mM Tris-HCl buffer, pH 8.0, at -80ºC for 3 months without any apparent loss of activity. The results of purification of protease from Pseudomonas thermaerum strain GW1 are summarized in Table 4. The DEAE fraction was analysed on SDS PAGE (10%), showed presence of single band indicating a homogeneous preparation. The enzyme has a low molecular weight of approximately 43Kda (Fig. 4 Lane 2). Zymogram activity staining also revealed one clear zone of proteolytic activity against the blue background for purified sample at corresponding positions in SDS-PAGE (Fig. 4 Lane 3). Activity of the enzyme was determined at different pH ranging from 3.0-12.0. The optimum pH recorded was 8.0 for protease activity. Protease activity was found to be stable in the alkaline range starting from the pH 5-11 at 45°C (Fig. 5). 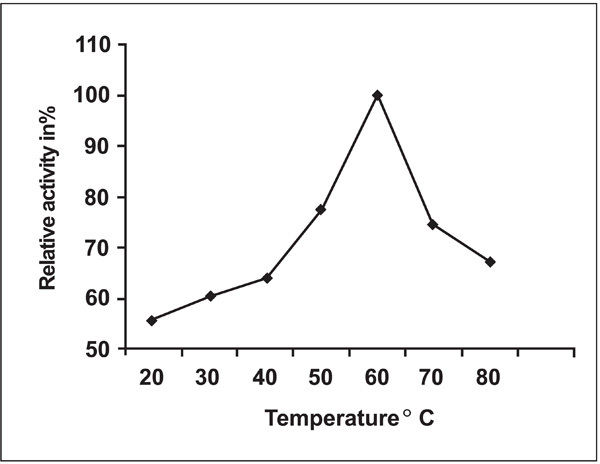 The thermal stability of the enzyme was also tested at different temperatures 20°C, 30°C, 40°C, 50°C, 60°C, 70°C and 80°C on incubation for 60 minutes (Fig. 6). The optimum temperature recorded was at 60°C for protease activity and Protease activity was found to be stable in the temperature range from 40°C - 70°C. The enzyme activity gradually declined at temperatures beyond 70°. Fe2+ has a strong inhibitory effect, whereas Zn2+ and Hg2+ have mild effects on protease activity. Interestingly Mn2+ strongly activated enzyme activity by 5 fold (Table 5). 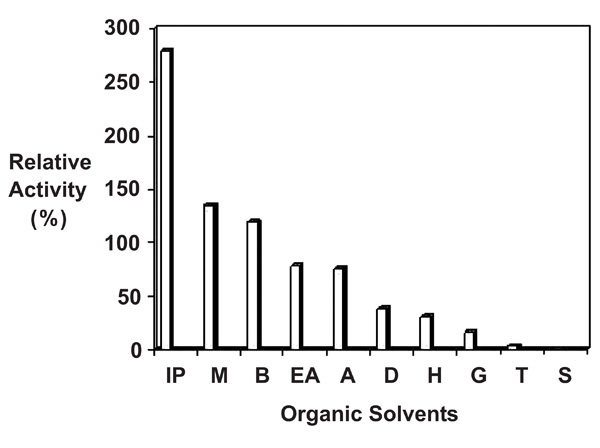 Ten organic solvents were used to study the effect on protease activity. As shown in (Fig. 7) the protease has ability to act in the presence of solvents in reaction system. The enzyme retained 78% and 75 % of activity in the presence of ethylacetate and acetone respectively. The presence of isopropanol, methanol and benzene increased the activity of isolates GW1 by 2.7, 1.3 and 1.1 fold, respectively. Enzyme lost 60% of total activity in presence of DMSO and hexane and was not stable in the presence of glycerol, toluene and sucrose. Ogino et al.,  have reported importance of disulfide bonds for stability of the protein in presence of solvents. Jorden et al.,  have reported that 61% of the activity of HIV1 protease was lost in presence of 12% Me2SO; similar results were also reported from protease thrombin . This loss of hydrolytic activity over time as reported by the authors is not due to slow dissociation of enzyme dimer into inactive monomer. The activity of HIV1 is also sensitive to glycerol and the hydrolytic efficiency of this enzyme decreases with the increasing concentration of glycerol. Table 6 reveals that if the concentration of glycerol is as low as10%v/v. then there is 38% decrease in Protease activity whereas 45 %decrease in enzyme activity is reported in presence of 20%v/v glycerol. Ours is the first report that shows extracellular production of proteases from Pseudomonas thermaerum. Protease from GW1 strain lost its activity in the presence of glycerol, sucrose and metal ion iron. Enzyme activity from Pseudomonas thermaerum is lost in the presence of glycerol and sucrose. The buffer best suited for Pseudomonas thermaerum protease should minimize the use of glycerol and sucrose during dialysis. So far, several well-known proteases such as thermolysin, papain, and chymotrypsin have been used as biocatalysts of peptide synthesis in the presence of organic solvents. Protease from Pseudomonas thermaerum retained its activity in organic solvents; these results are in line with many studies that report protease stability in the presence of organic solvents [25-29] promising potential industrial application of protease from Pseudomonas thermaerum. We are thankful to Department of Biotechnology, Jaypee Institute of Information Technology (Deemed University) Noida, India for providing infrastructure facilities for this study. Gupta R, Beg QK, Lorenz P. Bacterial alkaline proteases: molecular approaches and industrial applications Appl Microbiol Biotechnol 2002; 59: 5-32. Kumar CG, Takagi H. Microbial alkaline proteases: from bioindustrial viewpoint Biotechnol Adv 1999; 17: 561-94. Oberoi R, Beg QK, Puri S, Saxena RK, Gupta R. Characterization and wash performance analysis of an SDS-resistant alkaline protease from a Bacillus sp World J Microbiol Biotechnol 2001; 17: 493-97. Tomar R, Kumar R, Jagannadham MV. A Stable Serine Protease, Wrightin, from the Latex of the Plant Wrightia tinctoria (Roxb.) R. Br. : Purification and Biochemical Properties J Agric Food Chem 2008; 56: 1479-87. Gaur S, Wadhwa N. Alkaline protease from senesced leaves of invasive weed Lantana camara Afr J Biotechnol 2008; 24: 4602-8. Rao MB, Tanksale AM, Ghatge MS, Deshpande VV. Molecular and biotechnological aspects of microbial proteases Microbiol Mol Biol Rev 1998; 62: 597-635. Fang Y, Liu S, Wang S, Lv M. Isolation and screening of a novel extracellular organic solvent-stable protease producer Biochem Eng J 2008; 43: 212-5. Karbalaei-Heidari HR, Ziaee A-A, Schaller J, Amoozegar MA. Purification and characterization of an extracellular haloalkaline protease produced by the moderately halophilic bacterium, Salinivibrio sp Enzyme Microb Technol 2007; 40: 266-72. Min Z, Cong Z, Xiang D, Ping LF, Chen G. Expression, purification, and characterization of a thermophilic neutral protease from Bacillus stearothermophilus in Bacillus subtilis Sci China C Life Sci 2008; 51: 52-9. Abidi F, Limam F, Marzouki MN. Purification and characterization of an alkaline protease prot 1 from botrytis cinerea Appl Biochem Biotechnol 2007; 141: 361-76. Sarin R, Mishra P. Purification and characterization of organic solvent stable protease from Bacillus licheniformis RSP-09-37 Appl Microbiol Biotechnol 2008; 79: 399-405. Jellouli K, Bayoudh A, Manni L, Agrebi R, Nasri M. Purification, biochemical and molecular characterization of a metalloprotease from Pseudomonas aeruginosa MN7 grown on shrimp wastes Appl Microbiol Biotechnol 2008; 79: 989-9. Yang JS, Liu W, Ni JR. Isolation, identification of lignin-degrading bacteria and purification of lignin peroxidase Huan Jing Ke Xue 2006; 27: 981-5. Fontoura R, Spada JC, Silveira ST, Tsai SM, Brandelli A. Purification and characterization of an antimicrobial peptide produced by Pseudomonas sp. strain 4B World J Microbiol Biotechnol 2009; 25: 205-13. Aitken MD, Stringfellow WT, Nagel RD, Kazunga C, Chen SH. Characteristics of phenanthrene-degrading bacteria isolated from soils contaminated with polycyclic aromatic hydrocarbons Can J Microbiol 1998; 44: 743-52. Holt JG, Krieg NR, Sneath PHA, Stately JT, Williams ST. Bergey’s manual of determinative bacteriology . 9th. Baltimore: Williams and Wilkins 1994. Miller JH. Experiments in Moleculer Genetics Cold Spring Harbor Laboratory, Cold Spring Harbor, NY 1972; 431-5. Tsuchida O, Yamagota Y, Ishizuka J, et al. An alkaline proteinase of an alkalophilic Bacillussp Curr Microbiol 1986; 14: 7-12. Choi NS, Yoon KS, Lee JY, Han KY, Kim SH. Comparison of three substrate (casein, fibrin, andgelatin) in zymographic gel J Biochem Mol Biol 2001; 34: 386-96. Ogino H, Uchiho T, Yokoo J, Kobayashi R, Ichise R, Ishikawa H. Role of intermolecular disulfide bonds of the organic solvent-stable PST-01 protease in its organic solvent stability Appl Environ Microbiol 2001; 67: 942-7. Jordan SP, Zugay J, Paul L, Darke S, Lawrence C, Kuo SQ. Activity and dimerization of human immunodeficiency virus protease as a function of solvent composition and enzyme concentration J Biol Chem 1992; 267: 20028-32. Wasiewski W, Fasco MJ, Martin BM, Detwiler TC, Fenton JW. Thrombin adsorption to surfaces and prevention with polyethylene glycol 6,000 Thromb Res 1976; 8: 881-6. Gupta MN. Enzyme function in organic solvents Eur J Biochem 1992; 203: 25-32. Ogino H, Watanabe F, Yamada M, et al. Purification and characterizationof organic solvent-stable protease from organic solvent tolerant Pseudomonas aeruginosa PST-01 J Biosci Bioeng 1999; 87: 61-8. Gupta A, Roy I, Khare SK, Gupta MN. Purification and characterization of a solvent stable protease from Pseudomonas aeruginosa PseA J Chromatogr 2005; 1069: 155-61. Ghorbel B, Sellami KA, Nasri M. Stability studies of protease from Bacillus cereus BG1 Enzyme Microb Technol 2003; 32: 513-8. Rahman RNZRA, Geok LP, Basri M, Salleh AB. An organic solvent-stable alkaline protease from Pseudomonas aeruginosa strain K: Enzyme purification and characterization Enzyme Microb Technol 2006; 39: 1484-91.